Who said that private America wouldn’t re-leverage itself again? 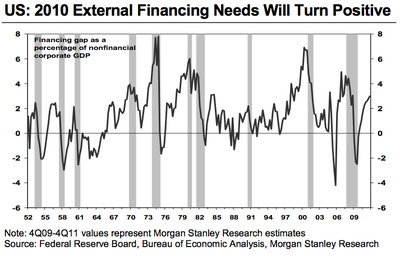 Morgan Stanley thinks we’re on the cusp of substantial private loan growth, since household balance sheets have stabilised and corporations have massively de-levered. New era for households does not mean no borrowing: Private credit demands are poised to rebound, as consumers have substantially repaired their balance sheets, Corporate America will likely soon start to accumulate inventories and boost capex, and credit availability continues to improve. This modest rebound and massive Treasury borrowing needs will put significant upward pressure on real yields over 2010-11. 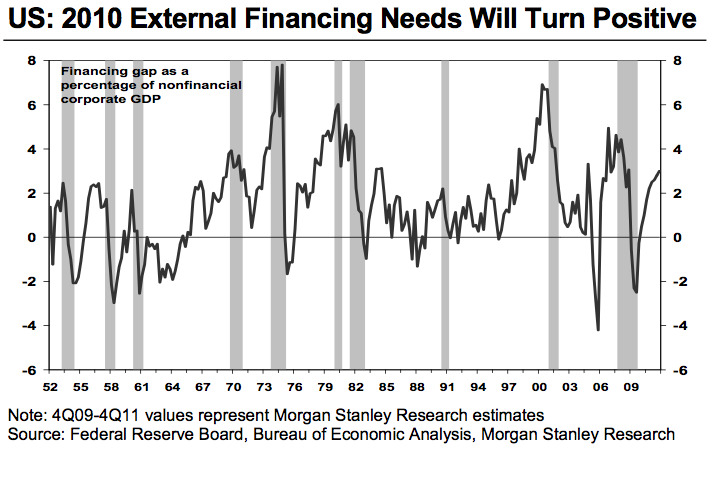 Corporate financing inflection point arrives: Corporate external financing needs are likely to turn positive soon as companies begin to accumulate inventory and increase capex, and as the growth in corporate cash flow slows. The combination is apt to boost corporate credit demands, perhaps sooner than expected. This growth in private demand, which would be refreshing after we’ve had simply government demand for so long, could start to pull up in real Treasury yields since there could be more supply of debt. Supply-demand balance points to higher yields: Treasury yields have remained low partly because of minimal competition from private borrowers. That’s about to change. Coupled with growing concerns about the sustainability of US fiscal policy, we think that this shift will promote significant increases in real yields this year.